Hey there, friends! A great new project for a super good cause– the Friends of P site is now live! The brainchild of Yvonne Jukes, Garrett Morin, & Ryan Waller, Friends of P is an awesome project to raise funds for the Lupus Foundation of America, in honor of their mutual friend P. The site features a great cover of The Rentals song “Friends of P” done by Toyko Police Club (watch the little record-player spin!) and the first fifty donations of $15.00 receive a complimentary (and hottt!) tote bag with a limited edition design by Garrett and Ryan, both highly admired contributors to our Part of It project. Help out a good cause and donate today! And for those who aren’t among the first fifty donations? The tote is now available at the Part of It site. Speaking of Earth Day and being kind to our environment, here’s a lovely and practical tote designed by Genevieve Guackler. No matter what shape you’re in, or color you’re feeling, this little number will make you feel better. Handy for toting your recyclables, your library books, your water bottle and your munchies, this is a perfect accessory for all seasons. Available from Part of It, $20. Design also available on a fetching navy tee, $28. Part of It in Nylon! Wow! We are just so psyched about this! 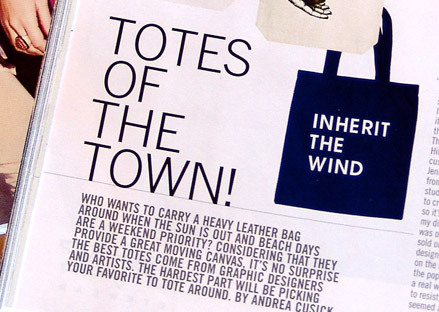 Nylon Magazine features Part of It’s “Inherit the Wind” tote (designed by Mark Owens, $20.00 from Part of It) in the 2008 April issue. We were excited to be featured alongside designers like Tracy Jenkins of Village, Keren Richter, and the good folks at Loyalty and Blood. So many cool totes, so little time! With Spring on it’s way, it’s time to start making art… (really, it’s always a good time, but there’s plenty of inspiration growing up these days). This great design by Dustin Hostetler (aka UPSO), formerly available only on t-shirts, is now available on beautiful natural tote bags ($20). A portion of the profits from this design is designated for the Arts Commission of Greater Toledo, an awesome arts organization that promotes and supports the arts in Ohio. Totes and tees are both available from the Part of It. Dustin recently told us that Faesthetic #8 is at the printers. Hey hey hey! That’s totally grand news. Gluekit is super thrilled that the nice folks at American Way Magazine chose to feature Mike Perry’s “It’s You and Me” shirt from Part of It in a recent column. A portion of the profits from sales of the design are designated for NARSAD, an organization that is focused on finding ways to identify and find treatment for psychiatric disorders. Part of It was one of six initiatives featured, all of which funnel money toward good causes. If you’re flying American Airlines any time soon, check out the article!